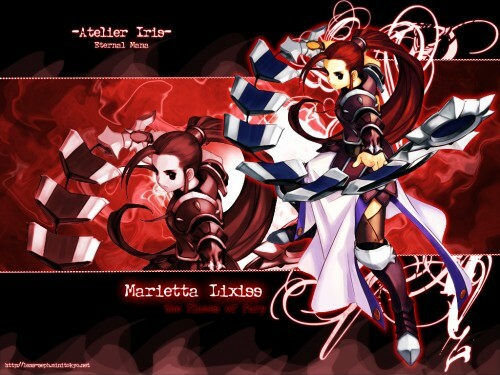 Browse Atelier Iris: Eternal Mana Gallery: Recent | Popular. it's not that bad quality. i like the backgroud and the chara is pretty nice. While I may not be a fan of magnifying scans for a certain character twice shown within the same wallpaper, I do have to admit that the way you placed them neatly altogether is quite intriguing nonetheless. You actually seem to blend the character with the somewhat overpowering background quite well, and the position of the characters finely tune in with the entire layout, in my own perspective over here. I do like how the picture seems to fit together overall to give it that mysterious, dynamic feel. Nice picture of Marietta. To make it short. I really just love your wallpapers ><.